If you like letterpress printed posters--Nashville's Hatch Show Print is one of the holy mecca sites of the art form. They've been a working print shop since the late 19th century and this book covers their ups and down periods while celebrating the glorious posters they've created through the decades. I liked reading about the history of the shop and Nashville, but the star of this book are the recreations of various posters, handbills, photos of the shop and images of the actual letterpress equipment. I was recently in the shop and am kind of in awe of this place, so loved reading more about the history while having the time to really stare at some of the things they've printed in their history. Essential reading for anyone interested in type, layout, or graphic design. 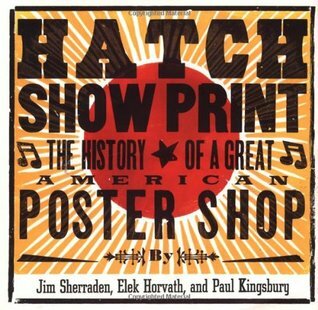 A fantastic account of Hatch Show Print and their style. Inspirational and entertaining. The history is questionable, but the images are amazing! Great overview of a letterpress legend!